AMC's Talking Dead returned last night, but it wasn't quite business as usual. The show returned in honor of the mid-season premiere of Fear the Walking Dead and, as has been the case for the last seven years, Chris Hardwick hosted the after show. But this is the first episode since Hardwick faced sexual abuse accusations from his ex-girlfriend Chloe Dykstra. Hardwick was noticeably emotional during his return. The network removed Chris Hardwick from his position as host of Talking Dead while they conducted an investigation. 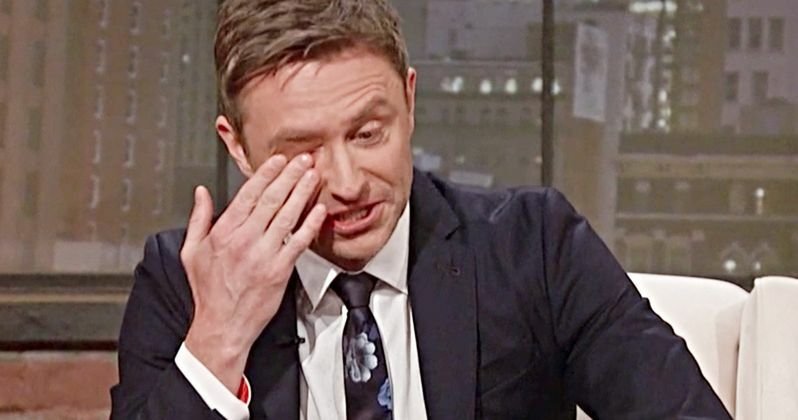 Hardwick skipped out on San Diego Comic-Con, with Yvette Nicole Brown stepping in to host the Walking Dead panel and the recent Talking Dead preview special. AMC concluded in their investigation and, based on their findings, they decided to reinstate Hardwick. To open the show, the host addressed the situation. Here's what he had to say. "Hi. Uh, you know, normally I recap the show we're about to talk about here, but instead I really just want to take a minute, and I want say that I am so appreciative to be standing here right now and I want to thank you, the Walking Dead community, for all of your support these last couple of months. You know, this show is not just a job to me, this is, this is a vital part of my life, and this has been like a sanctuary these last seven years we've been here. This has been with me through good times and bad times and I have so much gratitude to you, the fans, and the producers, and the amazing casts of both of these shows, you know, for allowing me to come here and be a part of this community every week. This is what this is. This a community." His other series, Talking with Chris Hardwick, was put on hiatus once the allegations were made public via an essay posted online by Chloe Dykstra in June. The network has yet to announce a premiere date yet, but Talking will return soon now that Hardwick has been reinstated. The host added that there are changes coming on both Fear the Walking Dead and The Walking Dead over the coming months and reiterated his thankfulness for being back. "And we're on the precipice of a lot of changes on both Walking Dead shows in the coming weeks and months, and I am so looking forward to going on that journey with you. And I've said the following words a million times, countless times, and yet I have never been more thankful than I am in this moment to say to you: I am Chris Hardwick and this is Talking Dead." NBC also conducted an investigation and recently reinstated Chris Hardwick as host of his game show The Wall. Once the allegations were made public, Nerdist removed Hardwick's name from the website entirely. Once they finished their own investigation, Nerdist decided to restore his name as founder of the site. In the wake of these decisions, Chloe Dykstra took to Twitter to assert that she has evidence to back up her claims. "Hey dudes. Just a reminder: I 100% stand by every single word of my essay. I made sure it was unembellished, factual, and that I had evidence to back it up in order to protect myself in case of actual litigation (not a network investigation, where I'm not protected). That is all." Dykstra decided not to participate in AMC or NBC's investigation. Chris Hardwick's various reinstatements have come with some backlash. Several key members of the Talking Dead production crew quit once he was reinstated and Nerdist contributor Donna Dickens decided to no longer write for the company once they decided to put his name back on the site. Talking Dead airs Sundays on AMC.